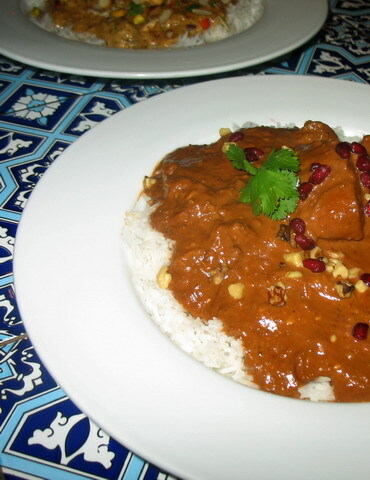 Koresh e fesenjan is a famous Persian dish where chicken is poached, and then smothered in a sauce consisting primarily of pomegranate juice or molasses and walnuts, with a few spices, primarily cinnamon and pepper, added. The chicken with the rich, thick deep mahogany brown sauce, is served over rice, with a sprinkling of fresh pomegranate seeds and walnut bits over it as garnish. It sounds fantastic, and I remember making it years ago for Zak and I–right after I started writing this blog, in fact–with the plan of presenting the recipe here–but, well, we hated it. Even with lots and lots of rice to tame it, the sauce was too intensely flavored, even though I followed the directions to the recipe faithfully. It was just too much–and that says a lot, because both Zak and I love strong flavors. So, I never got around to writing about it, in large part because I never made it again. That is, until I started working at Salaam. Hilarie asked me to make it one night for a dinner special, then confided to me that she never much cared for the dish herself, but that other folks liked it. I did a bit of research online and found a few different recipes for it that added other ingredients, like tomato paste, roasted pureed eggplant and garlic, and I thought about it a good bit. The flavor that I objected to was the intensely sour richness of the pomegranate molasses–it was too heavy, and I couldn’t taste the chicken when it was so strong. I also thought that the flavor was too one-dimensional–with just the pomegranate molasses dominating, it led to a very flat tasting dish, and no one wants a dinner special that tastes flat. Dinner specials should be well-rounded with flavors and textures that knock your socks off. So, I decided to change the recipe considerably, and in the process, made it taste smoky, tangy, sweet, rich, delicately spicy and creamy on the tongue, all at the same time. The chicken is evident as a flavor as well, since I poach it in chicken stock and add that to the sauce, while the sweetness comes from deeply caramelized onions and garlic, a dab of tomato paste, as well as a drizzle of honey. I kept the cinnamon, and added a bit of cumin, and a tiny bit of chile sauce, just to liven things up a bit. The smoky note comes from grilled eggplant pulp. And finally, to smooth it all out, I added heavy cream and pureed the sauce to a velvety texture with an immersion blender. The end result is a dish which may not be traditional Koresh e Fesenjan, but it tastes utterly fantastic. I smiled to myself and wandered back to the kitchen, pleased to have given such pleasure to someone I didn’t even know. Put chicken pieces into chicken stock or broth, and bring to a simmer. Simmer, covered, until chicken is just done. Remove chicken from pot and allow to cool until you can just handle it, then tear it into bite sized pieces. Preheat broiler. Wash the eggplant, then dry it. Oil the skin well and pierce in several places with the tip of a knife. Place on a rack in a baking pan and roast it under the broiler, turning it often, until the skin is charred and the flesh is soft. Remove from the broiler and set in a metal or glass bowl, and cover with plastic wrap to allow it to steam. When it is cool enough to handle, cut the stem end off and peel. Mash the flesh through a fine-meshed sieve to remove seeds, discarding seeds and juice. You should get between 1-1 1/2 cups of pulp from the eggplant. Set pulp aside, and discard the rest. Meanwhile, simmer the stock or broth to reduce it until there is about a cup and a half of it left. In a heavy bottomed Dutch oven or stockpot, heat oil over medium heat. Add onions, and cook, stirring, until they are deep golden brown. Add garlic and spices, and cook until the garlic is golden and the onions are deep reddish brown, stirring as needed. Add walnuts and cook, stirring, for about four to five more minutes, until the walnuts brown lightly. Add the honey, hot sauce, tomato paste, pomegranate molasses, eggplant pulp and chicken broth or stock. Cook for about five minutes, stirring constantly, adding water in very small amounts if needed to keep it from sticking. Using an immersion blender, puree the sauce and blend in the cream. Add salt to taste, and correct seasoning as needed. Bring to a slow simmer, add chicken pieces, and allow to warm to serving temperature. Serve over rice, and sprinkle each serving with a generous amount of fresh pomegranate seeds, walnut bits and parsley. This is really good served with a salad of fruit, cheese, and greens with a pomegranate vinaigrette. My husband has developed a recipe for fesenjun which is simpler than this. He enjoyed this dish weekly at Ali Baba in Davis, CA. We can’t find pomegranate molasses, so we use 100% pomegranate juice (the recipes we had found reconstituted the molasses) – maybe that’s why we never found it overpowering? But one thing is for sure – rancid walnuts will ruin the experience. We look forward to trying your variation – with all the nuanced flavors, it’s bound to be wonderful! oo, this sounds fantastic. Any ideas on leaving out or subbing the eggplant? I”m allergic. I am curious about an eggplant sub too since my husband hates them and we think my elder daughter might have a sensitivity to them. But otherwise, this sounds awesome! You’re like a Foodie Fairy, bringing new tastes to others as if by magic!! This update looks like a good one…although you may want to try the original one more time, using your own idea to cut the acidity in the sauce by using chicken broth, and by perhaps halving the lemon juice if you were using it. An Iranian friend of ours makes this rather often and her version is really just barely sour, the main impression is made by the velvety walnuts and chicken broth mixture. what size bottle of pomegranate molasses? Beth–I am sorry I missed your comment until now. I will change the recipe to reflect this, but I use between 8-10 ounces of pomegranate molasses per batch, depending on the size of bottle I have on hand. Oh dear, I was looking for a vegetarian version of fesenjoon and came across your blog…it may have been the most painful thing to read ever…it hurt my every Iranian bone! Barbara, I finally made this recipe last night for a dinner party and it was amazing! Wonderful fragrances and flavors. No pomegranates to be found in VT in the summer, unfortunately, but I garnished with chopped cherries for color. The hardest part was mashing the eggplant through my wire mesh strainer. But it was worth it – everyone raved about the dish!